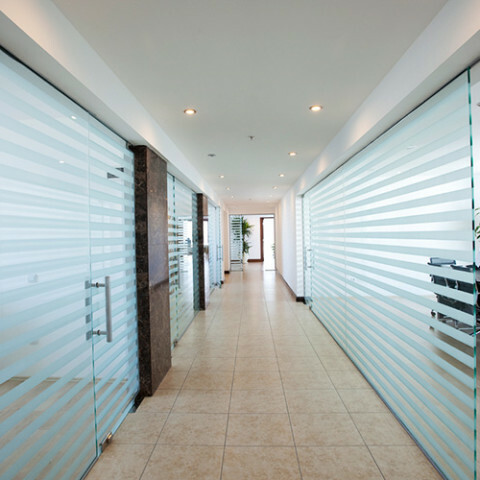 Glass Partition Suppliers Manchester – Glazing Innovations can offer you the sleek look of modern day glass partitioning available on today’s market. Not only do they look fantastic the systems we can provide are very cost effective. Frameless glass partitions are a designers dream, they are a very efficient & cost effective way to create a Great elegant office environment. Framelaess Glass Partitions are an ideal way to separate work areas yet still allow light and interaction throughout your entire office space. Our frameless glass partitions are Installed to the existing walls and ceiling of your office using an aluminium frame. To join the glass to glass panels we will either use clear plastic strips and a clear silicon sealant to create a fabulous frameless effect. The Glass used in our partitioning systems are Clear 12mm or 10mm thick Toughened safety glass for the glazed panels. These have been tested to the highest safety standards. Our Partitioning systems are a perfect glazed system for normal office use where standard performance is the prerequisite. Sleek, symmetrical head and base tracks, complemented by a slim aluminium door frame and crystal clear dry joints, give the system a minimalist appearance.